wristwatchredux: Hublot’s Vivacious Contender: Viva Italia! Hublot’s Vivacious Contender: Viva Italia! As the 2014 FIFA World Cup continues, another luxury watchmaker besides Hublot is aggressively capitalizing on Brazil’s Green and Yellow and the international football frenzy we are enjoying this year. Enter GaGàMILANO, with its exuberant colors and flamboyant, playful dial-style Arabic numerals. I first became aware of the company last month when I saw an ad for it and its Quirky Tourbillon in Taschen’s Spring magazine. My reaction to it was “what a clever use of the word “quirky”! Meaning for me a peculiar or extravagant action. 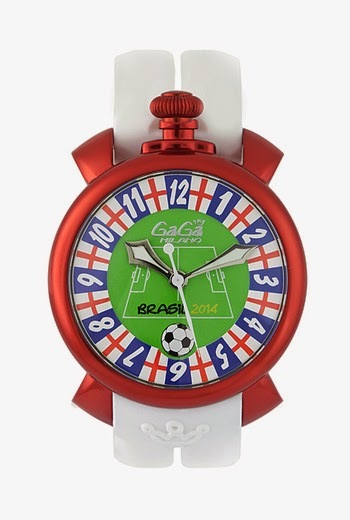 And its visual Action and Attraction we get from GaGàMILANO’s Brasile World Cup Collection’s Manuale 48 MM, a limited edition of 300 pieces paying tribute to six cup competitors: Brazil, Italy, Japan, Argentina, Spain and England. 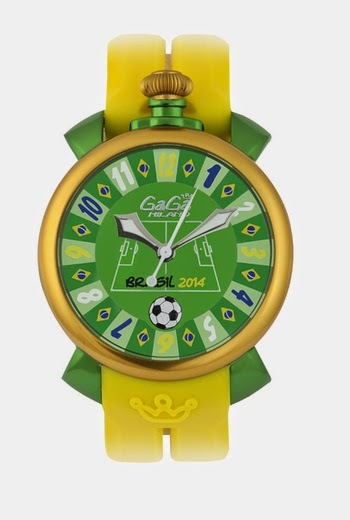 Each of the collection’s dial face design is anchored by a green soccer field and the phrase, “Brazil 2014” with the year done in yellow above a soccer ball. What distinguishes the country-specific models are the national flags that separate the dial numerals. GaGàMILANO has retailing partners in all of these countries except Spain and England. 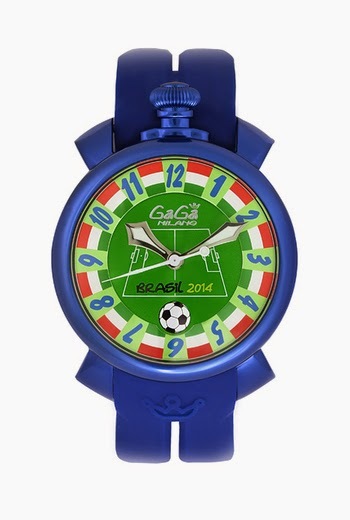 Although there is no GaGàMILANO USA watch design for the 2014 FIFA World Cup, the company offers a Manuale 48MM/Las Vegas model. GaGàMILANO has eight dedicated boutiques internationally with one in Beverly Hills and another in Honolulu. Expect greater overall brand familiarity and popularity and in its watch line-up collections, even more surprising visual punch in its dials and mechanical movements. So who which team or teams are you supporting in the World Cup this year and which watchmaker do you champion with or without a 2014 FIFA edition? Thank your for your interest in my blog. Your message will be reviewed to determine suitability for posting. Copyright Maryhelen Jones. . Watermark theme. Powered by Blogger.